2019 coupon books for membership fees are expected to arrive before January 1. The monthly payment option is only available to members who maintain a current account status. Coupons cover the membership dues and the Drinking Water State Revolving Fund (DWSRF) loan payment amount. Water usage fees are invoiced separately by mail every other month. See a breakdown of member fees here. Due on the 31st of each month. Volunteers removed over 60 cubic yards of woody debris from the trail. Learn how this made it better for our leafy, feathered, and furry neighbors as well. The Annual General Meeting was held at the Scenic Estates Clubhouse on August 25. The proposed Budget will maintain dues at $725 per year, having a total income of $382,595 and expenses of $382,597. Dues do not include the DWSRF loan, RTS, and water usage fees. An audit of the 2018 fiscal year to be performed in 2019. The estimated cost of an audit for 2018 fiscal year is $8,000. The judicial panel of the U.S Court of Appeals for the Ninth Circuit has unanimously denied a petition for panel rehearing and rehearing en banc. Read the complete order here. Proving that he is truly incapable of taking no for an answer, Charles Ortego requested a rehearing by the same three-judge panel that rejected his claims and a rehearing en banc (by the entire Ninth Circuit) on July 5, 2018, which is rarely granted even in meritorious cases. According to LISECC attorney Jessica Goldman, "The only avenue for review remaining is a petition for certiorari to the United States Supreme Court. At this point, this case concerns only issues of state law and there is zero chance the Supreme Court would accept review." The Reserve Study for 2018 (standard level 3 study update without a site visit) with funding recommendations for the 2019 fiscal year has been completed by Reserve Consultants, LLC. You can download the Reserve Study as a PDF file here. 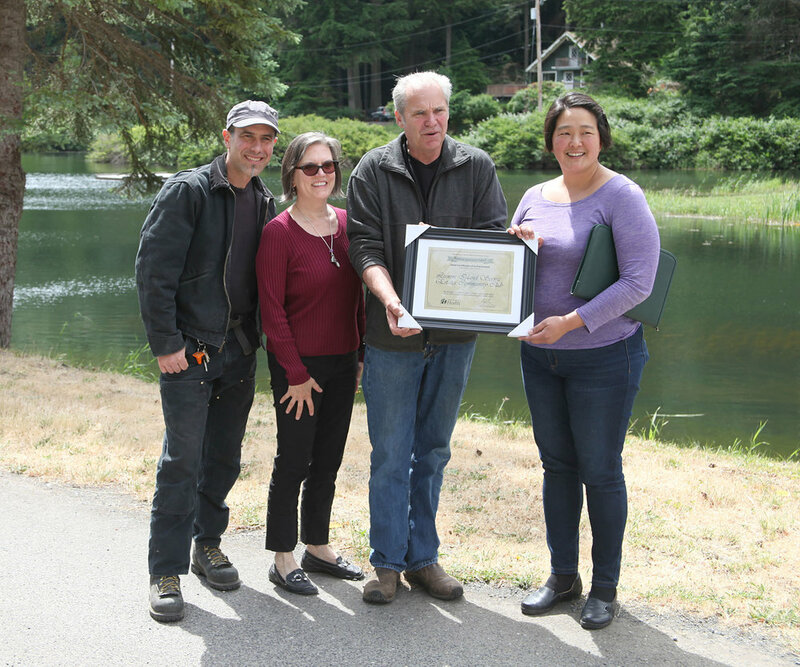 Lummi Island Scenic Estates (LISE) was awarded the Gold Certificate of Achievement by the Washington Department of Health today. Regional Engineer Joyln Leslie presented the award to Operations Manager Kevin Southworth, along with LISE President Leslie Dempsey and Treatment Plant Operator Isaac Colgan. To qualify for the Gold award the water system must exceed turbidity removal standards and have no violations with the Department of Health for at least 10 years. There are only seven rapid rate filtration water treatment plants in the State of Washington that currently qualify for the Gold (10-14 years) and Platinum (15 or more years) award. LISE is the smallest system this select group. The performance of rapid rate filters for turbidity (particle) removal is a key element in protecting consumers from microbial contaminants and maximizing public health. The Ninth Circuit Court of Appeals has completely affirmed the decision of Judge Lasnik in US District Court in favor of the defendants Lummi Island Scenic Estates Community Club (LISECC) and rejected the appeal of Chuck Ortego and other plaintiffs. The district court properly determined that LISECC has continuing authority to govern all of the properties comprising Lummi Island Scenic Estates. to act “reasonably and in good faith” in their stewardship of the water system. The district court did not abuse its discretion in denying Plaintiffs’ motion for sanctions. Plaintiffs provided neither the authority to support sanctions nor a meaningful explanation of why sanctions were warranted. Watch the recording for case: Charles Ortego v. LISECC (Case No. 17-35030) at the United States Court of Appeals for the Ninth Circuit. This hearing was in Seattle, Washington on June 12, 2018. Volunteers reduce wildfire danger at the Clubhouse and learn about Firewise. Thanks to Frankie Small, our Firewise coordinator, Lummi Island Scenic Estates has a chance to win a $500 grant to help Wildfire Preparedness at the Clubhouse and Marina. We are a wooded community our Clubhouse is surrounded by trees reaching up hill, is at the bottom of a hill, and the surrounding vegetation really needs to be brought under control. Trees need to be limbed up and underbrush made manageable. Scenic Estates is on the side of a steep incline and our neighborhood slope has been described as a "chimney" for fire to sweep up the mountain. 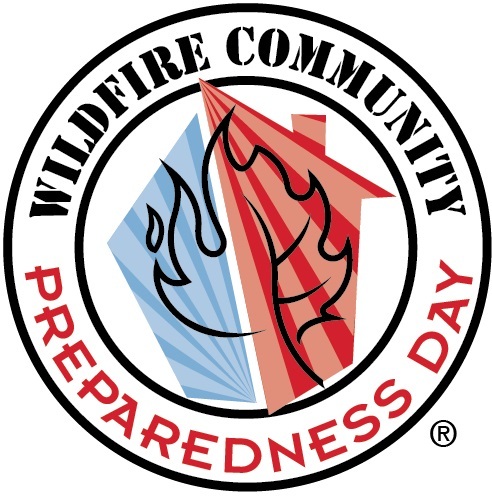 Our plan would be to have a work party to do this on Wildfire Community Preparedness Day (Saturday, May 5). The grant would help Scenic Estates rent a chipper to help with the clean up. Some of our members have worked hard to Firewise their own lots, but we really need all the help we can get to prepare for wildfire. Permitted species of brush, limbs, and wood chips will be delivered to the Lummi Island Heritage Trust Aiston Preserve to help reclamation. 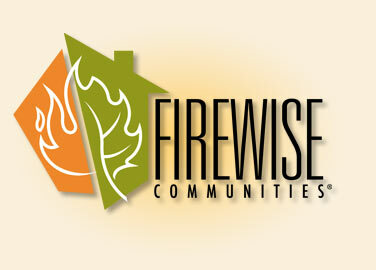 Scenic Estates has been working with NFPA Firewise USA since 2003, the second site in Washington to be recognized as a Firewise Community. Members are now receiving their 2018 Membership Fee Invoices. Enclosed in this envelope is the 2018 member letter and contact update form. Members can also update their contact information, sign up for email updates, and add an additional contact on the LISECC website here. Also included in the mailing is a Lummi Island Community Association (LICA) phone directory listing form for updating the island phone book contact information. This form is optional. We have included this as a courtesy to LICA as we feel this is a benefit to our members. Board of Directors and other election results. "I have been rereading the documents prepared for the court. I find myself unable to agree with some of the statements made."